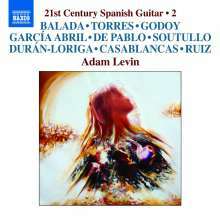 Der Artikel 21st Century Spanish Guitar Vol.2 wurde in den Warenkorb gelegt. Balada: Caprichos Nr. 11, "Abstractions of Granados"
This is the second of a four volume series presenting new Spanish works for solo guitar commissioned as part of the acclaimed guitarist, Adam Levin's residency in Spain. 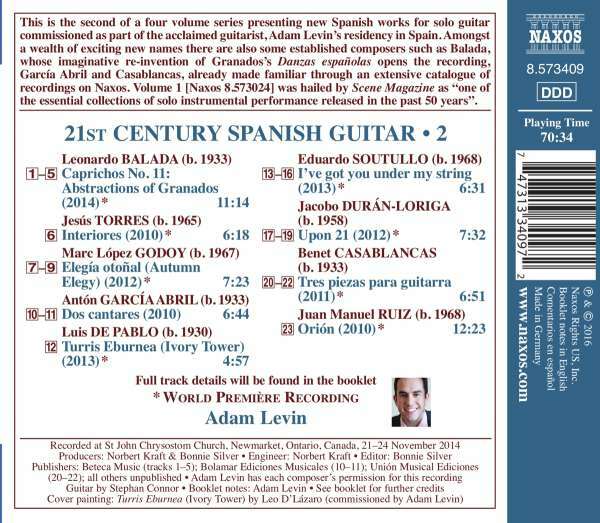 Amongst a wealth of exciting new names there are also some established composers such as Balada, whose imaginative re-invention of Granados's Danzas españolas opens the recording, García Abril and Casablancas, already made familiar through an extensive catalogue of recordings on Naxos. Volume 1 [Naxos 8. 573024] was hailed by Scene Magazine as »one of the essential collections of solo instrumental performance released in the past 50 years«.